Mikella represents a variety of clients in the entertainment industry, including actors, comedians, directors, writers, producers and social media-based entrepreneurs. She assists clients with a number of talent services agreements for scripted TV shows, unscripted/reality TV shows, feature films and social media endorsement deals. She assists production companies with drafting and negotiating talent agreements and other production-related agreements. Mikella also represents clients in soft intellectual property (IP) matters, with a focus on trademark prosecution and counseling clients on the prosecution and registration process. During law school, Mikella worked as a summer associate at Fox Rothschild. Prior to that, she worked as a summer associate at a business litigation law firm in the Philadelphia area, and as an in-house litigation intern at Aetna, Inc. Mikella also completed a year-long externship during law school with a Philadelphia-area law office, assisting with litigation, trusts and estates, Title IX compliance and investigations for colleges and universities and Title IX litigation matters in higher education. 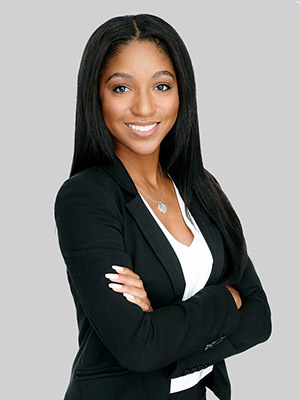 While pursuing her undergraduate degree at USC, Mikella worked for four summers at Comcast Corporation as a public relations and communications intern. She also gained experience in the media industry by working at Universal Pictures as a marketing intern for feature films, and with NBCUniversal’s TV Distribution Group as a strategic partnerships intern for cable networks, including E!, Bravo, Syfy and USA Network. Mikella earned her undergraduate degree in Broadcast & Digital Journalism from the USC Annenberg School for Communication and Journalism, working as a student TV reporter, radio reporter, and on campus news anchor. She earned a minor in film from the USC School of Cinematic Arts. While in college, Mikella wrote, filmed, directed and edited a documentary film with a classmate and under the supervision of award-winning documentary producer Dan Birman. Mikella began pursuing her interest in media and entertainment in high school by interning at a local news station, WMAR-TV, an ABC network affiliate in Baltimore, Maryland. During college, Mikella volunteered as an English/reading tutor to elementary school students learning English as a second language. In high school, she studied classical music and piano in the Johns Hopkins University Center for Talented Youth and continues to play piano today. In her spare time, Mikella enjoys running and fitness, tennis, and salsa dancing. She speaks conversational Spanish and enjoys practicing her Spanish language skills. Mikella writes for the firm’s Pay or Play entertainment law blog, providing a legal perspective on issues impacting the entertainment industry and intellectual property space, including the protection of right of publicity, copyright and trademark. You can find Mikella’s blog posts here.